Metal–organic frameworks with diverse structures and unique properties have demonstrated that can be an ideal substitute for natural enzymes in colorimetric sensing platform for analyte detection in various fields such as environmental chemistry, biotechnology and clinical diagnostics, which have attracted the scientist’s attention, recently. 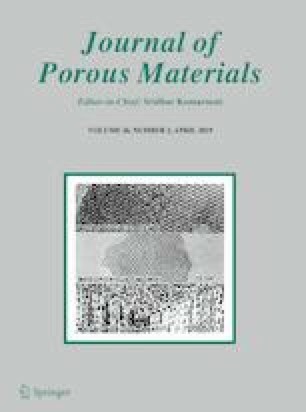 In this study, a porous coordination network (denoted as PCN-222) was synthesized as a new biomimetic material from an iron linked tetrakis (4-carboxyphenyl) porphyrin (named as Fe-TCPP) as a heme-like ligand and Zr6 linker as a node. This catalyst shows the peroxidase and catalase activities clearly. 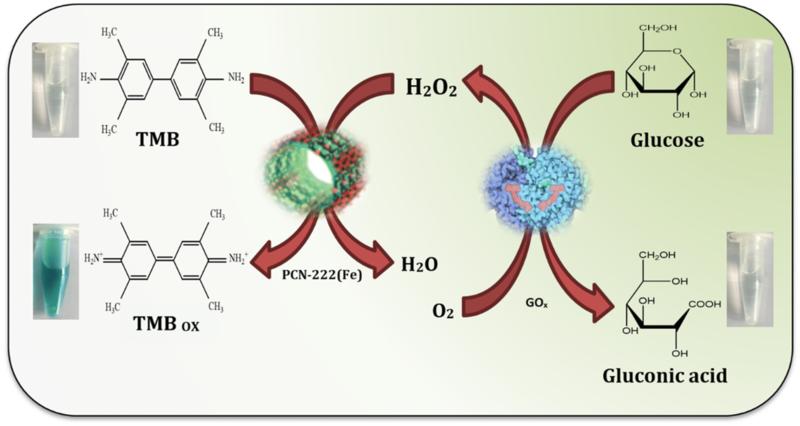 The mechanism of peroxidase activity for PCN-222 was investigated using the spectrophotometric methods and its activity was compared with the other nanoparticles which, the results showed a higher activity than the other catalysts. Also, the hydrogen peroxide was detected by PCN-222(Fe) based on the peroxidase-like activity. For detection of hydrogen peroxide a linear range of 3–200 µM and detection of limit (LOD) 1 µM (3σ/slope), under optimal conditions were obtained. Moreover, based on the high tendency of PCN-222(Fe) to combine with the TMB as a chromogenic substrate in the peroxidase-like activity, we developed the sensitive and selective colorimetric assay for glucose detection that was found a detection limit (LOD) of 2.2 µM in the linear range from 12 to 75 µM. Finally due to the good catalytic activity of PCN-222(Fe), it was used to detection of glucose and hydrogen peroxide in real samples.